A relationship with a Pisces lover can feel like chasing a beautiful reflection in the water. Then the reflection dissolves and reappears over there. Before you know it, you’re far from shore. The allure of the Pisces man or woman lies in the endless possibilities they represent. But those who have swum (or drowned) in their waters may question if the chase is worth it. Is it possible to establish a solid relationship with the slipperiest of signs? In the “Pisces lover” category I’m including anyone with their Sun, Moon, Venus, Mars or Ascendant in Pisces, or in aspect to Neptune (Pisces’ ruler). As I write this, I’m fully aware that many Pisces/Neptune people make excellent partners. But they have certain characteristics that can be frustrating in relationships. Pisces expands things through dissolution. This can be seductive to you, because not only does Mr. Pisces appear to represent your dream come true, he dissolves your limits and fears. Having your boundaries loosened can be addictive. And this happens softly and painlessly. Neptune rules spirituality, as well as alcohol, drugs and artistic works (poetry, music, film) — anything that transcends the mundane world. Seeing that magic distilled into a person is immensely attractive. All Pisces/Neptune people have (or are) a conduit to that other world. The difficulties begin when you attempt to create something solid with Mr. Pisces. If he is acting out his Shadow, he can be deceptive. He may masquerade as one person, but eventually he’s revealed to be someone totally different. He could be an addict, or caught up in the mystical chase, always yearning after the ideal lover. He projects his Pisces/Neptune energy onto you, and when he discovers that you’re not the ticket to his dreamworld, he fades away. But sometimes, things dissolve because of what you’ve projected onto your Pisces. Miss Pisces has a way of triggering your most cherished fantasies, but it remains to be seen if she is who you’ve built her up to be. The dynamics of victim/savior, sadist/masochist, or artist/muse can come into play. Often, she is not who you’ve dreamed into existence, and the intensity of disillusionment is relative to the intensity of your ideals. Pisces energy is never cut and dried, so all of the above scenarios can be mixed together. You desperately want her to be something, and she obliges (consciously or not). But eventually, reality hits. So how do you navigate your attraction to a Pisces person? Just like any other sign, some Pisces are healthy and ready for commitment, while others are not. It can be tricky sussing this out, because clarity is not a Pisces trait. But we still live in the real world, and there are certain things you can depend on. Look at the actions of your Pisces love to determine if he or she is worth the investment of your time and energy. Eventually, even the dreamiest Pisces will have to walk the talk. Does she follow up with what she says she’s going to do? Can you live with his actions? If the answer to these questions is “No,” then you should probably move on. If you find yourself sucked into the whirlpool of ignoring deceptions/self-delusion, that’s a topic for a different article. If the answer to those questions is “Yes,” then you’ve entered a rare zone: the place where dreams and reality mesh. Understand that your lover will always have one foot in another world. This is true of even the most committed Pisces. When he drifts off, it’s not because he doesn’t love you. For all his compassion, your Pisces can be detached, because he is focused on what lies beyond the immediate world. His love is based on the awareness that we’re all part of a bigger pattern, and it’s a bit impersonal. This is not the Scorpio demand for intimacy, or the Cancer insistence on nurturing. If you want love that’s in your face and all about you, 24/7, that’s not Pisces. Even in his most intimate moments, you may get a sense that he’s not quite there. Pisces needs magic. If you demand that she “get real” (or whatever your version of this is) you’re denying who she is. You’ll never be able to completely pin her down; you might as well try crushing water in your fist. Again, this does not mean that she can’t be faithful. But it does mean that you’ll have to trust her. The flip-side of Pisces deception is belief. And if you’re attracted to this energy, part of you wants that magic in your life. Then you need to ask yourself what you’re projecting onto your Pisces. If he or she ends up disappointing you, what were your expectations to begin with? Amidst all the uncertainty, there are rare pleasures that come from being involved with a Pisces/Neptune lover. Compassion and empathy is simply off the charts. He can be endlessly forgiving of your faults, and often sees the magic in you that no one else sees. She can maintain a certain innocence, no matter how much life experience she has. In essence, the best way to navigate the waters of a Pisces relationship is to stay aware of your expectations and accept the magic. If you like this post, please upvote it on Reddit. Interesting… what happens when both partners have strong Piscean signatures, does that make them more compatible? I know a couple with the man’s moon conjunct his wife’s sun in Pisces. Independently they seem quite a bit more grounded than when they are together. They seem to reinforce each others fantasies to the point where neither of them has much grasp on reality and they do stuff that has people scratching their heads as to what they really thought was going to happen if they did xyz, and seem constantly surprised that the world doesn’t quite work the way they dreamed it up. They seem happy though, or at least it appears that way to me. Well… and what happens to a relationship in which both partners have Moon in Pisces? Is there any chance for happy ending,? or are they most likely end up with very painful break up after mutual projections finally crash with reality of who they are? Me and my partner have a lot of Pisces/Neptune interacting with our 7H stuff and our North nodes natally and in synastry. I am even a bit more Piscean than him i’d say. I could not imagine having a eat-drink-and-be-merry type for a partner (Which i learnt via relationship trials and lessons some years ago). So far we are happy and content in our mutually ‘spiritual/dreamy’ personal and working partnership, even if it gets a little bizarrely out-of-this-world at times. Pisces highly favors spiritual, minimalist life styles if adapted coherently. If both partners are on the same page with that, it can be the ticket to mind-blowing-tantric-heights in the relationship. there may or may not be a chance for a happy ending, but that entirely depends on the rest of the charts. yes, I would say that makes them more compatible and reinforces the Pisces, as you said. “Compatible” can be positive or negative, depending on what each person enables or strengthens in the other. Fiinyx, I am sorry about the “seeing double” thing, it was meant as a joke, I was trying to dedramatise a bit after all that thick stuff. 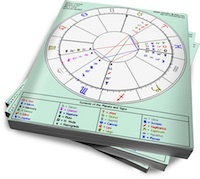 @fiinyx I’m a man having Pisces sun, moon, mc with Neptune contacts to all 3 of those plus venus. So take what I say with a huge grain of salt. I’ve dealt with these energies all of my life. First one is that your Pisces sun friend is deceiving herself on this man. Self deception is the hallmark of Pisces energy. This is the scenario you are worried about and the only way out is a hard dose of reality. Words won’t be enough. She has to see him being unfaithful (not just flirting). If he only has mc in Pisces this is the more likely scenario. Does he have other Neptune contacts? Second scenario : Nadia nails it when she says “you have to trust them. The flip side of Pisces deception is belief”. The man could be very much into her. The energy at play would be – how much do you trust me? Can you see me flirting with someone and still have faith in me that I will not betray you?? If this is playing out, your Pisces girlfriend would know it instinctively. But she can’t explain it to you and probing her about it is only going to be destructive. She has no choice but to make lame excuses for his behavior. How do you tell the difference?? It is very subtle. His actions will give him away. He won’t let her go. But do not expect her to confront him easily. Pisces hate confrontation. @ A..interesting insights.He does have other Neptune contacts..natal Scorpi Nep Rx (now direct by progression) conj his Desc sextiles his Vesta/Venus/Pluto in Virgo conjunction in th 4th.His natal Saturn (Rx by progression) conj Asc opposes his natal Neptune and trines his Balsamic Moon conj Sun cazimi Mars in Leo 1degs.His NN is in Pisces on his MC conj fixed star Formalhaut.Mercury is exact conj SN. My friend is always saying “I believe” all th tym too and “I don’t wanna know” constantly..I give up.She did leave him one tym which makes me think she too was secretly plotting for sometime but tells him she hasn’t trusted him for 13yrs.It was a shock for everyone around thm but then 10mths later goes back to him.She was doing so well on her own.He convinced her to take him back and she fell for it.Back to square one. The irony being he has been with other girls in front of her yet she chooses to ignore.In synastry his natal Nep falls on her Asc forming th peak of a YOD with her 6H Aries/Jup sextile 8H Gem/Mars..she has recently been diagnosed with brain cancer and I BELIEVE his dishonesty is actually making her physically sick the more she chooses to ignore.Sad how she does this to herself as I don’t really think she knows whats good for her or how to take care of herself properly (she continues to escape in drugs/alcohol/tobacco) despite being told not too..she is paying the price for being so driven (Mars) and will evntually just slip away into her illness.He is cold and uncaring other than for his own needs.I reckon he does love her but only for what he can get from her…he is Taurus Rising afterall..stubborn/selfish/creature of habit. I wish I could help her but I don’t know how..but don’t get me wrong I really love the Pisces energy for their creativity..my 9yr old son is Sun,Uranus,Venus,Juno in Pisces 12H and late Pisces Rising conj Merc! !H9 Saggi Moon too.He is extremely optimistic,gifted,dreamy,creative,loving and so so kind.I had th love affair of a lifetime during my Nep sq Nep transit and even tho it was brief I loved every minute of it..I did feel like th possibilities were endless, so alive and swept off my feet.When it ended abruptly I thought I was dreaming..disbelief..I had my swelling pregnant belly to remind me that I really was in love with a real person and I wasnt going crazy.However, I wouldnt change any of it..Im hapoy to have been able to feel that dreamy kind of love in this lifetime rather than not at all…sorry for the long post..this Gem Rising gettn carried away agn. @fiinyx after reading the details in your post, I firmly believe she is deluding herself. His presence in her life is like an addiction, perhaps like her other addictions. She isn’t finding the strength in herself to get out of it. 13 years, wow that’s a really long time. Find a way to get her de-addicted. Someone has to take control and strip from her the ability to make decisions. Thanks for yr insights A..yes 13yrs and counting..she actually prides herself on staying with him for that long over which tym a tumor has developed in her brain.He takes full advantage of her vulnerability and I really dislyk him for that.He says Im wrong of course (Iv gone into full on battle with hm on several occassions over this) but Im not stupid.Iv never really been able to fully understand what makes my friend tick but now I think I have sm idea.My prog Moon is at 23degs Pisces and its been a real foggy learning curve for my 1st house Cancer Sun! !The only way I think she will ever be free of him is if she met someone else maybe..but feels a little inadequate now she is sick.How do you detox an addicted Pisces? Is it really even possible?